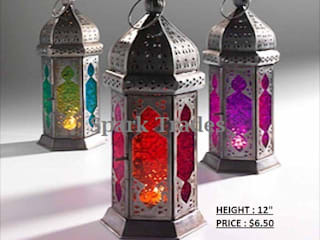 Product Specialty : Candle Lanterns, GE Electric Fitting Lanterns, Candle Holders, Chandeliers, Moroccan Lanterns, Mosaic Hanging Lanterns & Mosaic Votives. Product MATERIAL : Stainless Steel, Brass, Iron, Copper, Wood, Glass, Leather, Synthetic Acrylic and Resin etc. 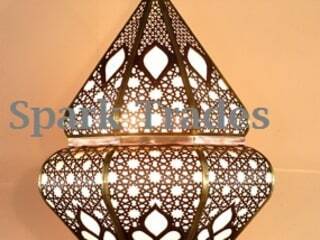 We Spark Trades are the manufacturers & exporters of All Kind of Handicraft Items based in Moradabad (Brass City) , INDIA. Our company is engaged in the business of manufacturing & exports for a long time and we have very satisfied customers. 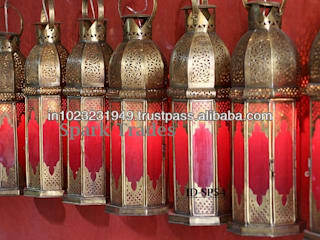 Spark Trades is a well known organized company in the market and has a very good repetition in the export market. We are exporting our items in Europe & US mostly and all our customers are well satisfied. Our Objective : To satisfy our clients/buyers upto the best extent by fulfilling their needs and supplying them quality products under the scheduled time limit. Our Price : We keep our price very much competitive so that our buyers/clients may not find our price higher than any other supplier. Production Capacity : We have our own three units in different cities of India for manufacturing our different items and we have very much production capacity for our items. MOQ : We also offer small quantities for our buyers/ clients for sample orders to check our time & quality. So we have a fixed a very small MOQ. Payment Terms : We usually accept payment through T/T or irrevocable L/C at sight and sometimes Western Union for small shipments. This is a brief description for our valuable clients.